In Japan!!! Why I love Taipei more still…. Monday night Han and I left Taipei for 21 days in Japan. We’re lucky enough that Han has a (wonderful, beautiful, and cool) sister Uken who lives in Tokyo who is housing us for most of our stay. I find every day in Japan I’m constantly comparing things to Taiwan. I’ve always wondered if I could, or would want to live here . So far Japan seems to be better than Taiwan in about a million different ways. Strangely some of the reasons that make Japan “better” make me love Taiwan more. Maybe I could stand to live here for a year when Han eventually has to do his mandatory military service but I am pretty sure now Taiwan is home. 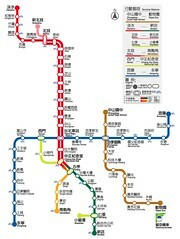 Taipei’s metro has 8 lines and 67 stations. 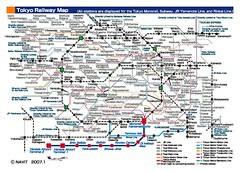 Tokyo has 13 lines and 282 stations. In all fairness Tokyo boasts a population of 12,790,000 to Taipei’s 2,630,515 but that’s just one more reason why I love Taipei more. It’s a love/hate relationship with me and the malls. Something else I didn’t expect is that Tokyo doesn’t share Taipei’s love of convenience stores. It’s hard to make anyone believe how many convenience stores are in Taipei unless you’ve been there and I have a hard time believing there are any countries that rival it. Between 7-11s, Family Marts, Hi lifes, Nico Marts, and some more I’m sure that I’m forgetting I feel like there is a conveniences store for every 10 people in Taiwan. It’s not weird to see a conveniences store next door to a rival convenience store with another across the street. Two 7-11s can sometimes be on opposite ends of the same blocks. According to Wikipedia there are 7000 7-Eleven locations in Taiwan giving it the 3 largest amount in the world… keep in mind that’s ONLY 7-Eleven. In comparison in Tokyo the convenience stores seem almost scarce but in place are vending machines EVERYWHERE. I still haven’t seen any of the famous beer vending machines but Soda, juice, and cigarette vending machines are everywhere. Oh and my last observation of something I don’t like about Japan so far before I get into what I love. People smoke here, it seems a lot! I’m actually really surprised. I hadn’t imagined this as a smoking culture. In my own life I’ve had less and less exposure to smoking and smokers. In high school it seemed like EVERYONE one smoked, and my closest group of friends and I, excluding a couple of people were the rare ones who didn’t. Then as laws were passed to prohibit smoking in more and more places smoking almost became invisible. I guess not being into the clubs is part of the reason why I haven’t been so exposed to it. In Taiwan it seems more similar to Canada, there are smokers but it seems on my beaten path,it’s a much smaller percentage of the population. Rarely do I see smokers in front of buildings or in parks. Sometimes flying by on scooters (smoking + flame seems like a bad idea but I see it) and sometimes in smoking sections of cafes or restaurants. I actually saw a propane delivery man (on a scooter with propane strapped to the back) with a lit cigarette before we left Taiwan. Yikes. So what’s good about Japan? – Everyone here is SO polite. Just ridiculously polite. I envy you being able to spend 21 days in Japan. I can usually only afford to spend 7 or 8 nights there. It’s really hard to compare Taipei with Tokyo (even though Taipei is trying very hard to be another Tokyo). 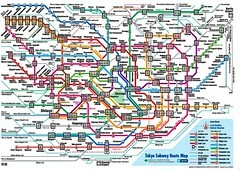 A more accurate comparison would be between Osaka or Nagoya. However, having spent time in both cities, I would have to choose Tokyo over Taipei. There are many reasons, but one in particular is that even though Tokyo is a huge, cosmopolitan metropolis, you can still get a good idea of what Japan and the Japanese are like. Other urban areas in Japan (Osaka, Nagoya, Fukuoka, Sapporo etc.) also provide the same commercial, cultural and entertainment options as Tokyo (on a smaller scale, of course). Taipei, on the other hand, often stands in stark contrast to the rest of Taiwan (and that includes Kaohsiung and Taichung). For example, you wrote how the situation regarding smokers in Taipei is more like that in Canada. Yet here in Fongyuan, in central Taichung County, I see people puffing away all the time, all around town. The propane man with a cigarette dangling from his mouth is a daily sight out here in the provinces! Tokyo is a gateway to the rest of Japan. Taipei is often a cocoon from the rest of Taiwan. Anyway, I hope you enjoyed your trip!